Llano’s vintage Lantex Theater is a great spot for entertainment on your weekend getaway to the Texas Hill Country. It’s one of the last historic single screen movie theaters in the United States, and it’s been restored to provide 21st century entertainment. Today’s audiences enjoy new seating and flooring, plus a state of the art digital projector and sound system. The theater shows classic and current films on weekends, and hosts the Llano Country Opry the second Saturday of every month. It also hosts the Llano Fiddle Fest on the first weekend in April each year, plus various special events and theatrical productions. According to its website, the theater was built in 1927 as part of the wave of new ones designed for “talkies”. The new Lantex was advertised as the “House of Comfort all Year” because its innovative evaporative cooling system produced “conditioned air.” Opening night, the standing room only audience paid 30 cents each to see Universal Pictures 70 minute long silent film The Fourth Commandment. Today the movie prices are higher, but they’re still only $5.00 for adults, $4.00 for seniors, and $3.00 for children 12 and under. Visit the website for the list of upcoming shows – December’s were selected for the holiday season. On the second Saturday of each month, the Llano Country Opry presents a matinee and evening performance. Admission typically is $20.00 per person. Visit the Opry’s web listing for upcoming stars such as Billy Dean, T Graham Brown, and Johnny Bush. The theater also posts its calendar and ticket information on Facebook. 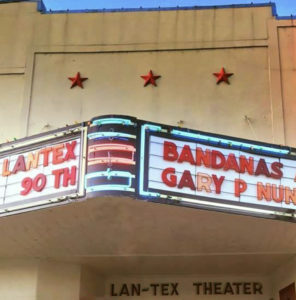 When you stay at Mustard Seed Bed and Breakfast on the Llano on your weekend getaway, you’re just a five minute walk down Main Street to the Lantex Theater on the courthouse square. Downtown, you’ll also find interesting shops, art galleries, and restaurants, plus a coffee bar and a wine bar. Walking toward the Lantex, perhaps you can imagine the family who lived in our farmhouse style B&B during the 1920s, following the same route on their way to see the newest talkie. Of course, today each of our three guest rooms has all the modern amenities you expect, including Wi-Fi and flat screen TV, plus a patio and kitchenette. When you’ve chosen your favorite, just give us a call 325)-247-0098, or go online to reserve your stay. This entry was posted in Attractions, Event, Music, Uncategorized and tagged Lantex Theater, Llano B&B, Llano Country Opry, Llano Fiddle Fest, Texas Fiddle contest by admin. Bookmark the permalink.